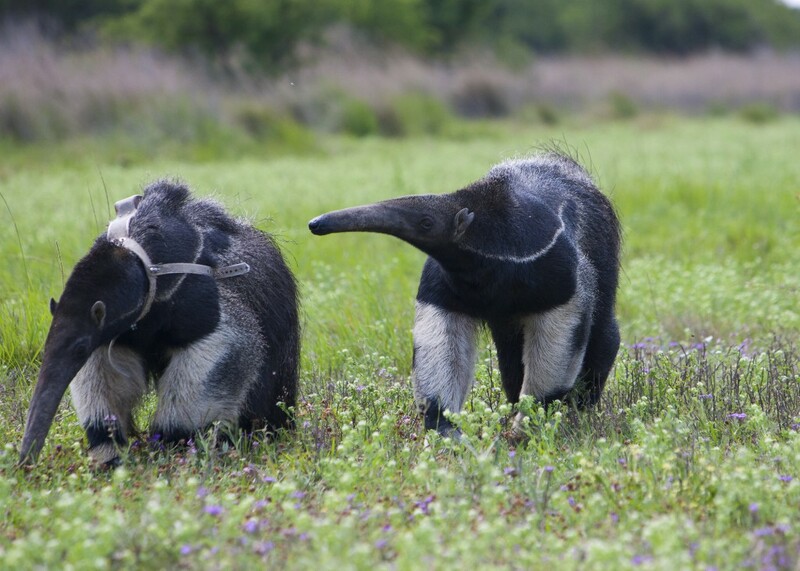 Five years ago, on October 17th, 2007, two giant anteaters named Ivoty Porá and Preto stepped out of their traveling cages to begin a free life in the grasslands of Rincón del Socorro property, in the area of the Iberá wetlands. A small group of supporters—park guards, townspeople, neighbors, and CLT team members—looked on with a heady mix of joy, nerves and pride. 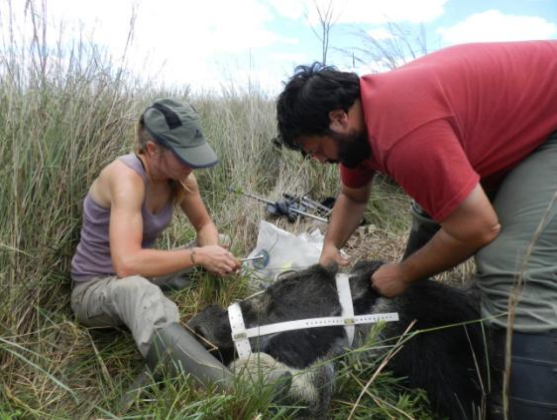 After many decades of absence, the giant anteaters were finally returning to roam the wilds of Corrientes! Since then, the program (and the population of giant anteaters) has flourished, and Ivoty Porá is the proud mother of four offspring born free at Iberá. Ivoty with her fourth offspring. Photo taken with a camera trap. 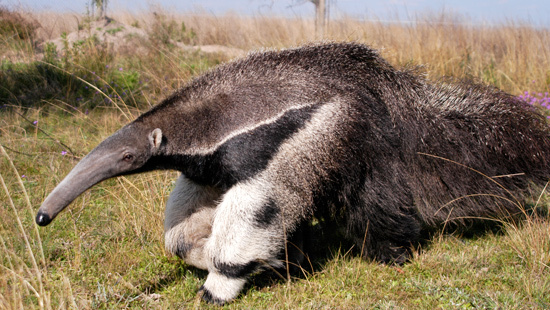 Once common, the giant anteater (Myrmecophaga tridactyla has been largely absent from the Corrientes Province for decades, suffering from habitat loss and persecution by humans. Over time, the giant anteater disappeared not only from the wildlands of Corrientes, but also from the cultural memory of most of its human inhabitants. Now after five years of dedicated work by our team of wildlife biologists and conservationists, it looks like history is ready to give the giant anteater a second chance, with a population of 28 introduced and 9 new native-born anteaters settling in to life at Iberá. 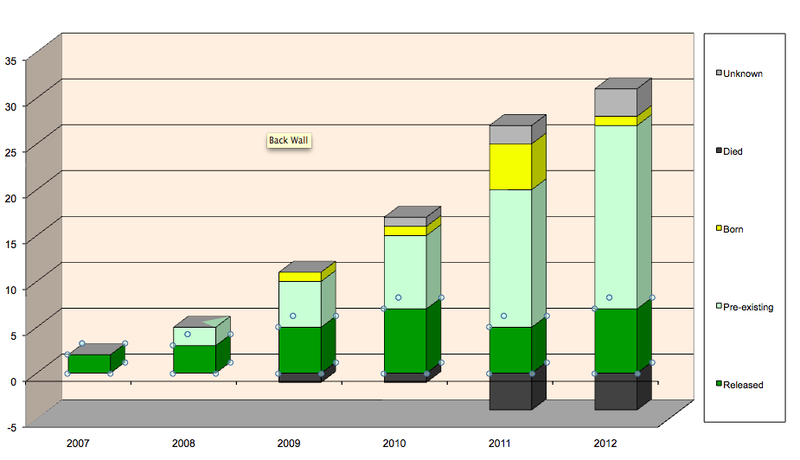 Graph demonstrating population dynamics of giant anteaters at the Iberá Natural Reserve. This November 22nd, we (CLT) commemorated the fifth anniversary of the project along with dozens of supporters and collaborators. Beer, wine, choripán and laughter colored the evening of celebration, and the stories of favorite anteater “personalities” were retold. 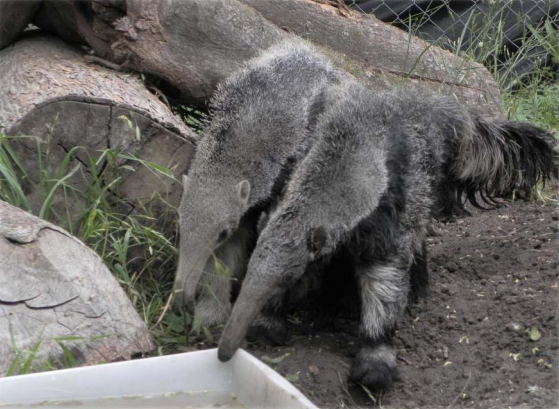 There was Tota, a heavy-set anteater that went missing for more than a year and was finally discovered, thin and haggard, dozens of miles from the reserve. After careful rehabilitation, Tota went on to father two healthy offspring that same year. There was Hata, run over by a car in Santiago del Estero, who endured five surgeries on his mangled leg, and still went on to live two happy years with us. And we can’t forget Formoseña, a beautiful female whose health was restored from critical condition so she could become a mother living freely at Iberá. But perhaps most of all we celebrated Ivoty, the first female to bear offspring native to the reserve, now a mother of four. Attending the celebration in spirit was world-renown naturalist George Schaller, whose pioneering studies with species as charismatic and difficult to study as the lion, the tiger, the jaguar, the mountain gorilla, the panda, and the snow leopard have inspired so many in the conservation community over the years. In 1975, Schaller was the first biologist to study the endangered pampas deer here at the Iberá reserve. A few months ago, Schaller returned to Iberá after forty years of absence, joyful to find that his original studies helped inspire the ground-breaking reintroductions of both the pampas deer and the giant anteater here in this magnificent landscape. What a pleasure to share our accomplishments in conservation with someone as knowledgeable and experienced as Schaller, from whom we have all learned so much! As the project continues to grow and more personalities are added to the group, the drama only gets more interesting . Over the last year, we added a total of seven new anteaters to the population: three juveniles, two adult males, and two adult females. 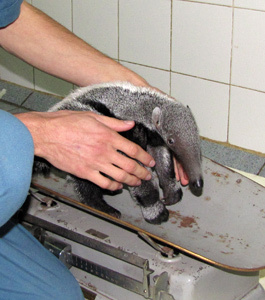 We also brought in our first anteater born in captivity—Poty, a young mother donated to the project by the Giant Anteater Conservation Project and the Barcelona Zoo. Our new additions were sadly punctuated by bad tidings, with four creatures falling to an especially harsh period of frost. These deaths have not only brought sadness to our study, but have also inspired us to hold higher standards of monitoring and care for this sensitive creature, especially in the first years of life in a new environment. 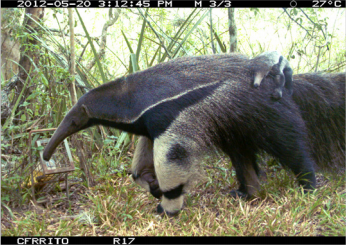 Slowly but surely, the giant anteater is returning to ecosystem of Iberá. 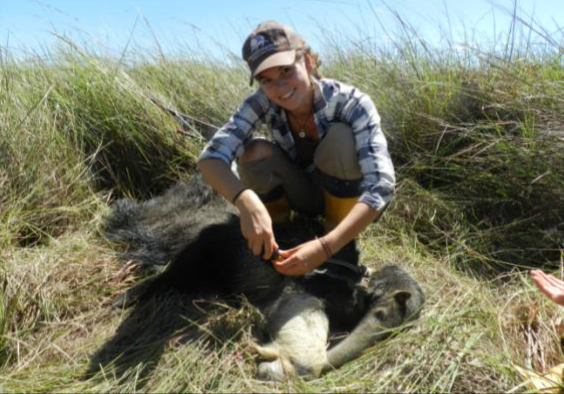 Of the 28 released anteaters, we know that at least 24–and up to 27–are still alive and flourishing. Four of the females have successfully given birth to a total of nine Iberá-native offspring, and we look forward to our younger females joining the ranks of anteater mothers. Over the last two years of the project, various park guards and tourists have even reported encountering anteaters in the outskirts of Colonia Carlos Pellegrini. Their range is spreading, and we couldn’t be more pleased. 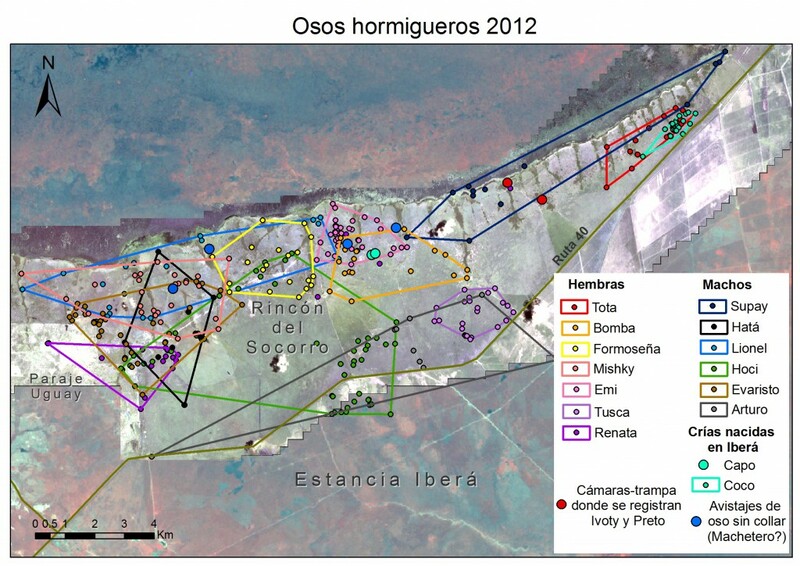 This map demonstrates the locations and ranges of the anteaters that live within the Rincón del Socorro reserve at Iberá. We wish to take the opportunity of our fifth anniversary to thank the many institutions and people who have made possible the return of this emblematic animal at Iberá. Thanks to the authorities of Corrientes, through two governments and various directors, who have always maintained their support of the project. 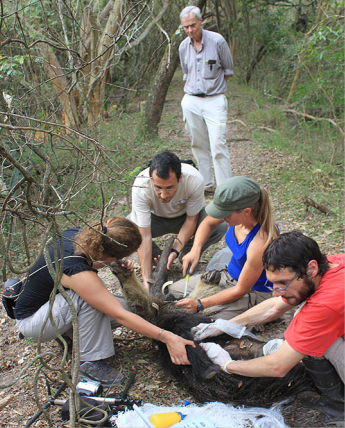 Thanks to Dirección de Fauna Silvestre de Argentina, which provided critical public support in the early experimental stages. Thanks to the governments of Santiago del Estero, Jujuy, Salta, Formosa and Chaco, which supplied the all-important base material for the project through the donation of rescued anteaters. To these honorees, we add Estación Experimental Horco Molle, the Florencio Varela Zoo, and all of the scientific advisors who have guided us through this exciting process. Finally, thanks to the CLT team, and to our volunteers who have followed and supported our work from rescue to recovery to release. Thanks to all for five years filled with learning, mistakes, insights, good and bad news, inspiring collaborations, and great satisfaction in this exciting venture! The Patagonia store in Buenos Aires joined us in celebrating this momentous occasion. Check out this video for lively scenes from the anteaters’ fifth “birthday party,” along with further details on the meaning of this project. For more information about this project and other ventures in the restoration of endangered species at Iberá, please visit our website. 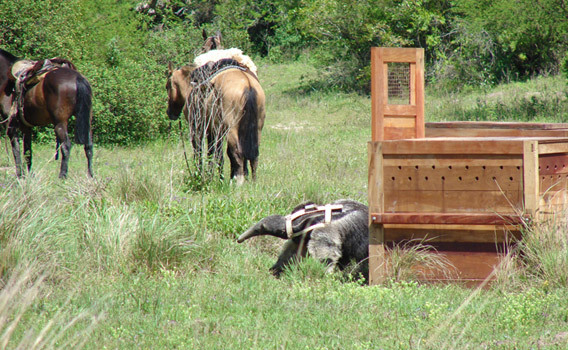 The very first anteater is released at the reserve in 2007. Diana adjusts Renata’s radio collar. Protected, and free to range the marshes of Iberá!